Stamp with Vanessa: Keep On Stamping! Hi friends! 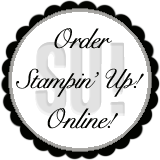 This was shared on the Stampin' Up! blog and I thought I would share it with you! Enjoy! I hope you have (or are thinking about) signing up for Paper Pumpkin. Beyond the cute project you can make with each kit, you are left with stamps and ink to keep stamping with. Below are some projects made using the “Try It” kit stamps, along with a few additional supplies. Order a set of note cards with envelopes, some fun ink colors, and your choice of embellishments—and you have 20 quick and easy cards to have on hand. Stamp the row of polka dots in the shape of an arrowhead (alternating colors). Swap out the sentiment—or leave it blank—to customize it to the occasion. I also added Designer Series Paper to sass up the envelope. Are you a scrapbooker? Are you into “Project Life”? This little 3" x 4" journaling card was fast to make. Stamp a stack and carry them in your purse—you never know when you’ll need to jot down a thought to preserve it. Headed on a road trip—or just need to quietly entertain the kids for a while? Stamp a bunch of 3" x 3" cards with rows of polka dots. Remember the dot game? Give the kids some markers and a few of these. Ahhhh . . . peace and quiet! I love little projects, so making 2" x 2" cards is fun for a few reasons. They are easy to cut, easy to create, and perfect for sweet little messages. I used the Jewelry Tag Punch, the Itty Bitty Shapes Punch Pack, and some Linen Thread to complete this card. Ink the word “Thoughts” using a Stampin’ Write Marker, and use just one of the polka dots to create the perfect flower center. Last, but not least, make yourself a cute, trendy desk decoration. I used a photo clip to hold up a mini playing card adorned with a Silver Glimmer Paper ampersand, along with two ampersands from the Jots & Thoughts Stamp Set. Add some ribbon to match your décor. Done. Post and pin the extra projects you make with the stamps from this kit. I will be keeping my eye out for them! Now, get stamping!